Heating, air conditioning and refrigeration systems consist of many mechanical, electrical, and electronic components, including motors, compressors, pumps, fans, ducts, pipes, thermostats, and switches. Heating and air conditioning systems control the temperature, humidity, and total air quality residential, commercial, industrial, and other buildings. Refrigeration systems make it possible to store and transport food, medicine, and other perishable items. 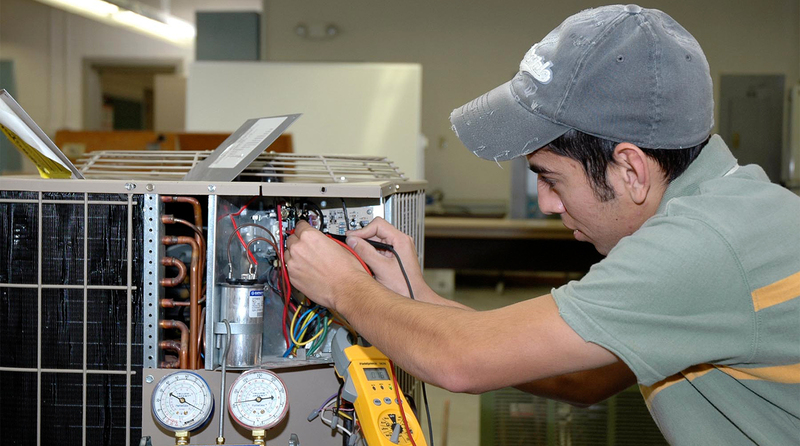 Heating, air conditioning, and refrigeration technicians install, maintain, and repair such systems. Some technicians specialize in either installation of maintenance and repair. Air conditioning and refrigeration technicians install and service central air conditioning systems and a variety of refrigeration equipment. Technicians follow blueprints, design specifications and manufacturer’s instructions to install motors, compressors, condensing units, evaporators, piping, and other components. They connect this equipment to the duct work, refrigerant lines, and electrical power source. After making the connections, they charge the system with refrigerant, check it for proper operations, and program control systems. When air conditioning and refrigeration equipment breaks down, technicians diagnose the problem and make repairs. To do this, they may test parts such as compressors, relays, and thermostats. When serving equipment, heating, air conditioning, and refrigeration technicians must use care to conserve, recover, and recycle chlorofluorocarbon (CFC) and hydrochlorofluorocarbon (HCFC) refrigerants used in air conditioning and refrigeration systems. Median annual salaries for air conditioning and refrigeration technicians were $47,000 in June 2015. The average hourly wage was $20. For more information visit www.payscale.com.